Why it’s OK to stay home reading a book or lock yourself in the bathroom at crowded parties. Let’s make one thing very clear from the start: being an introvert or extrovert is determined by whether you get your energy from being alone or from being around people. Introversion is often mistaken for shyness, but has nothing to do with that. Shyness is about fear of being judged by others. I am a huge introvert myself. And it took me some time and struggling before I understood that there is nothing wrong with that. 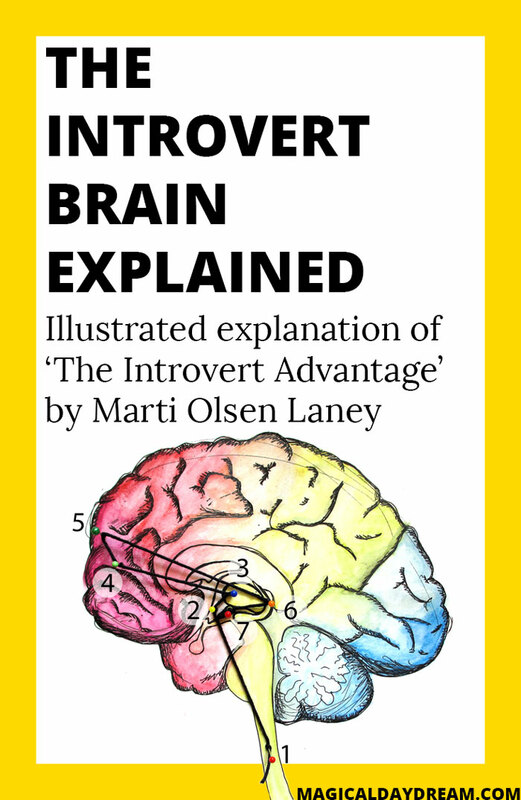 Reading the book ‘The Introvert Advantage’ by Marti Olsen Laney helped me gain some insight in myself. 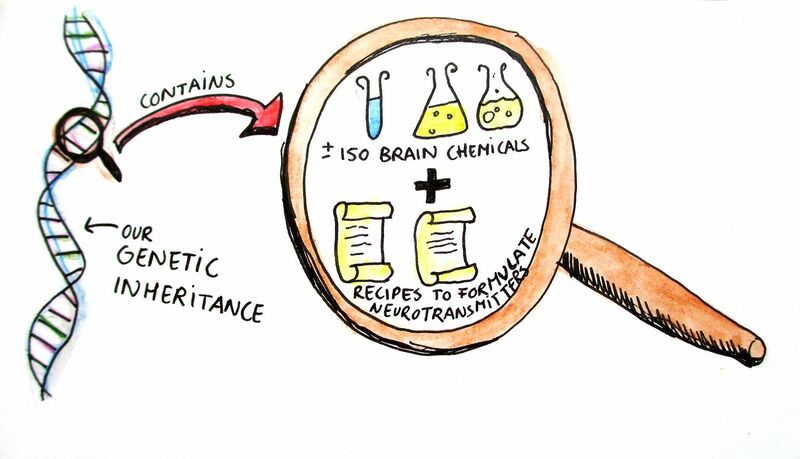 The most interesting part to me was getting to know more about the biochemical story behind it all: it helped me understand and accept how my brain functions. It was almost a relief that there is a logical explanation for why I might rather sit in my room drawing on a Friday night than go to a karaoke bar with the wild party kids. I would like to share some insights today that helped me understand better who I am. In fact, I drew them out for you. All of these drawings are based on ‘The Introvert Advantage” and most of the texts are literal excerpts. Hopefully they will give you some insight in yourself as well: just carefully read through the pictures. 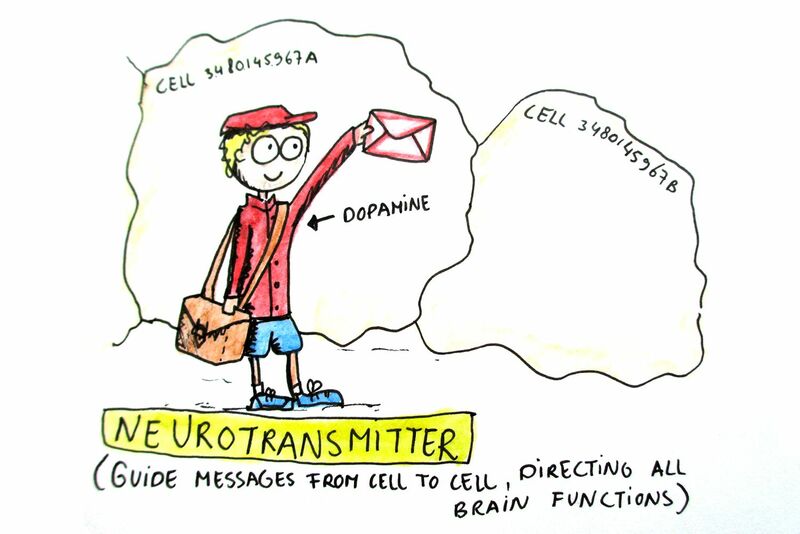 Ok so far: we have neurotransmitters that follow certain pathways in our brain and activate certain systems. Here is where it gets interesting. In a test, introverts and extroverts where asked to lie down and relax, while tiny doses of radioactivity were injected into their bloodstream. Then they were scanned to determine the most active part of the brain. They found two interesting things. First, introverts have more blood flow to their brains than extroverts. 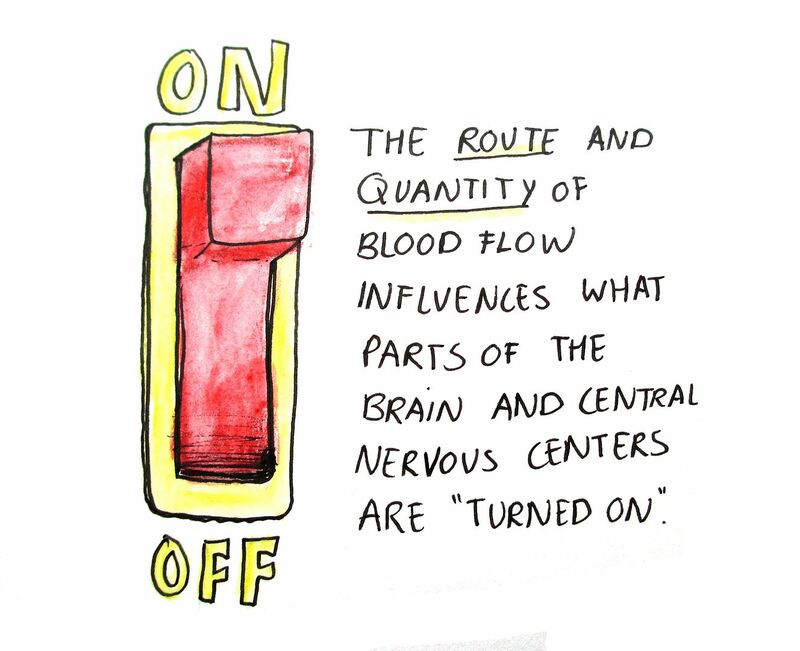 More blood flow indicates more internal stimulation. Second, introverts’ and extroverts’ blood travelled along different pathways. The introverts’ pathway is more complicated and focused internally. 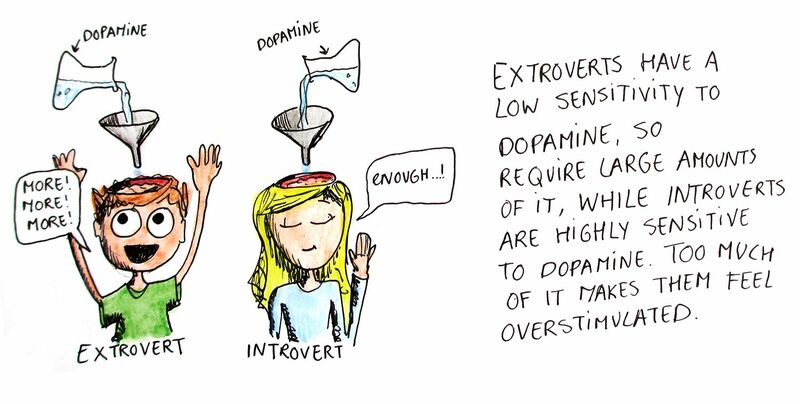 While the extroverts attended externally to what was happening in the lab, the introverts were attending to their internal thoughts and feelings. 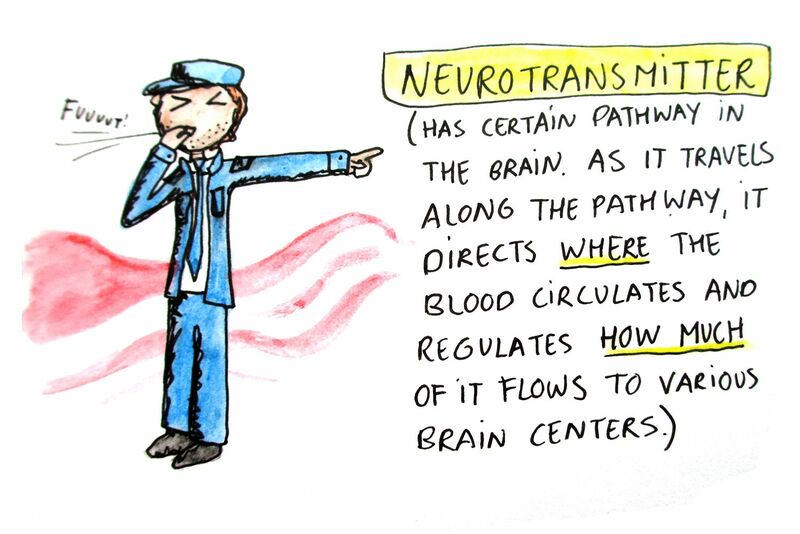 Not only does introverts’ and extroverts’ blood travel on separate pathways, each pathway requires a different neurotransmitter. 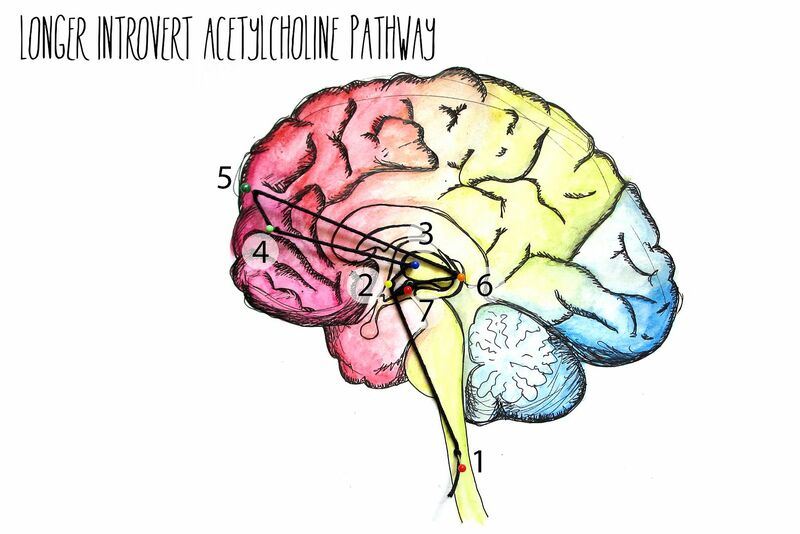 The pathway extroverts use is activated by dopamine, while the pathway introverts use is activated by acetylcholine. Let’s move on, because there is more! 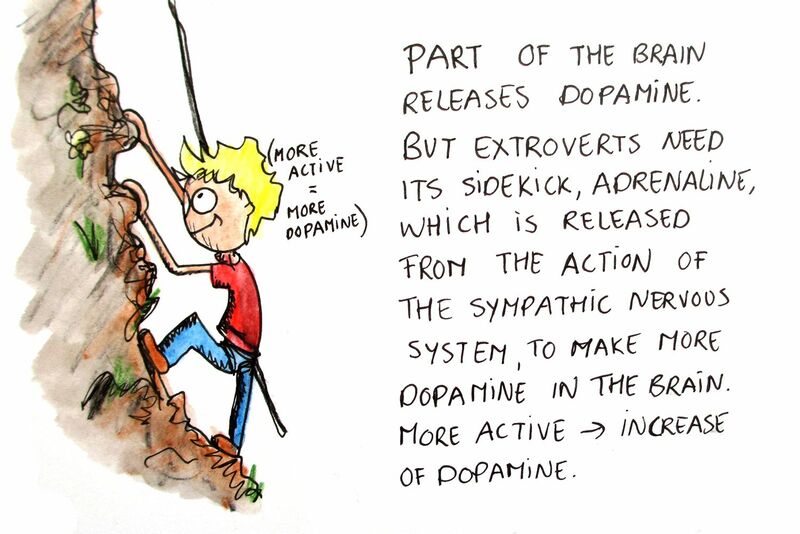 While extroverts are linked with the dopamine/adrenaline, energy-spending, sympathetic nervous system, introverts are connected with the acetylcholine, energy-conserving, parasympathetic nervous system. And that my friend, is the reason why you might occasionally need a break from being around stimulating environments with loads of people. It is why it is OK to sit home alone and eat cookies. Ever since I understand these biological principles my body seems to live by, I find it easier to recognise my introvert boundaries. I skip a party here or there more easily without feeling guilty or boring. I feel more loving towards this part of who I am, instead of trying to constantly live up to the image of an outgoing person. If you are an introvert, I hope this helped. The world can be confusing and extroverts don’t always get us, but I do. It’s OK to be quiet. And think a lot. And get tired easily from group activities. What do you think, should I draw more of these? If so, what would you like to see explained? Also, if you enjoyed this post, perhaps you want to consider liking my Facebook page to enjoy future updates! As an introvert and a mental health counselor this is fantastic information! Do you know where I might be able to find the studies about the brain chemical differences? 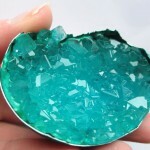 I want to do a presentation at work about them, and need the original sources for the doctors :-) Thank you SO much for your blog and articles!! Oops, I just read down the comments and see that you already answered this further down – sorry to repeat – feel free to delete the question!! No worries, hope it helped! :) Good luck with your presentation! This is so easy to follow and understand! Me too. 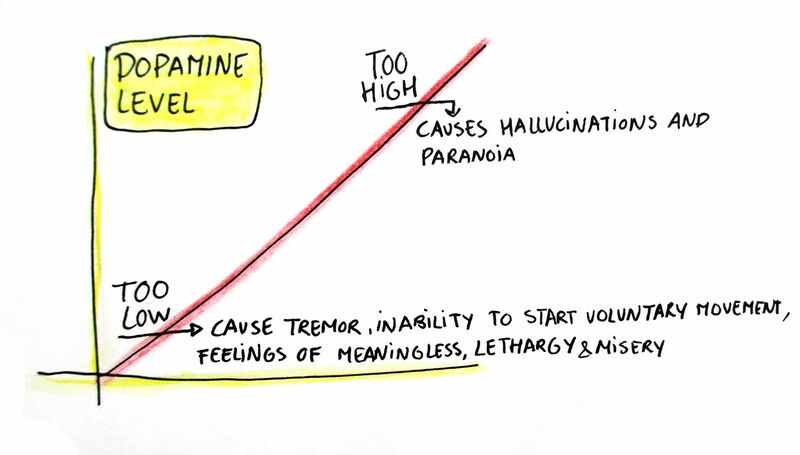 But according to this that might just be because the adrenaline your body makes increases the dopamine to such a level that it becomes overstimulating. Three cheers and a high five for using illustration as expression! I wish that Blogger and WordPress could sync up, because I want to reblog this. Do you know if there is any way? Otherwise, I will just include a link directing my readers here. Such an introspective and entertaining post. Brings solidarity to introverts and helps those who are extro see outside of themselves. :) I love this post! you should definitely do more of these! You could explain next, something that has to do with your subject of studies, or with Netherlands! maybe that thing with Dutch sea? that is above the level of the street? hehehe donno! Or maybe something about why blogging? I’ll love to see more drawings like these! I love this! 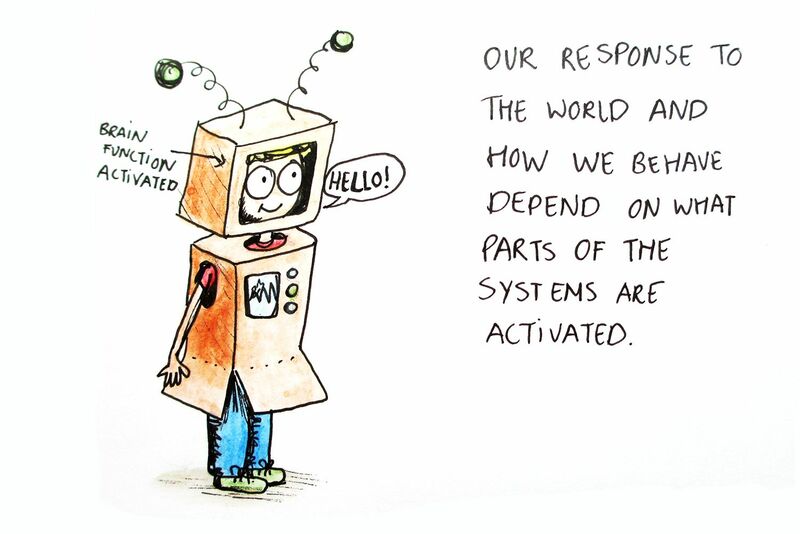 The sketches/drawings, the topic, the words written… Great post! :) Now I understand extroverts and introverts more. Thanks! You’re welcome, I am glad it helped! This must be my favourite blog posts of yours. It is funny, informative, beautiful and just wonderful. I have always been an extrovert. I can go into a room full of strangers and feel at home easily. However, i also love being on my own, reading, knitting, creating things, watching films. And so many times i would stay at home and not go out. I used to feel terribly guilty but now that i have read this, i think i’ll try and feel more at peace when i decide to stay on my own. What a great, breat post. Thank you. Have a lovely and creative weekend. Thanks, that is so good to hear! Isn’t it strange how much of us feel guilty for wanting to stay home? That’s exactly why I made this post: to make people more understanding and accepting of who they might be (or at least part of them). Even extroverts need time to wind down (the book goes into that as well). I really love how you used your illustration to explain this! Fantastic! OMG! I so need to read this book! I recently finished reading The Introvert’s Way by Sophia Dembling and enjoyed it a lot. I’ll definitely add this one to my to-read list ;); thank you! As an introvert studying neuroscience, this was FANTASTIC! You did a truly fabulous job and I’d love to see more posts like these in the future. Loved your explanation, good job! What reliable resources did you use other than “The introvert advantage”? If I had used any other sources, I would have mentioned them. Although my drawings are based upon scientific findings, I didn’t wish to approach this topic in a scientific way, but rather focused on creating something fun yet still understandable, making the information I gained from reading the book available to whoever wanted a ‘quick tour’ (yet selective one) through some interesting facts. 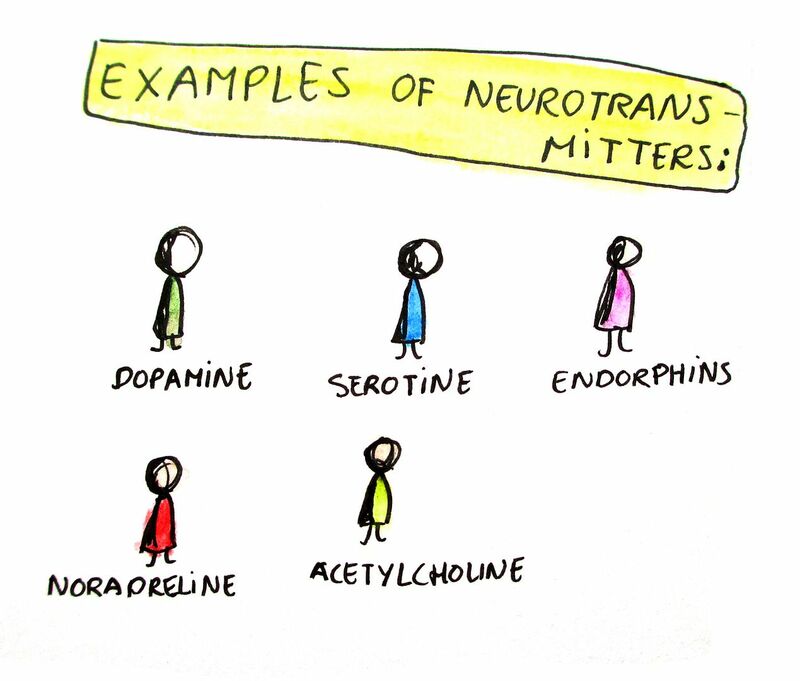 i knew i was different but different neural pathways and acetylcholine O_O woahhhh …. Fantastic post! I’ve long accepted the fact the I’m an introvert but worried when my 12 year old acts the same way. This is a great post to show her. 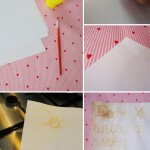 Love your pictures to help the “visual learners”. The other interesting point from the book is that introverts process their data a lot slower than extroverts and often process it deeper. If 5 extroverts are in a group with you , you are often processing what the first extrovert said by the time the 5 th extrovert has had their say. We are marathon runners, not sprinters when it comes to data processing. I’m so glad it was brought to this blog. Thank you for writing this! Thanks for the beautiful illustrating awareness! Nothing is better than a right self-consciousness. You’re right about the spelling mistake in there. I just added some text to correct it. 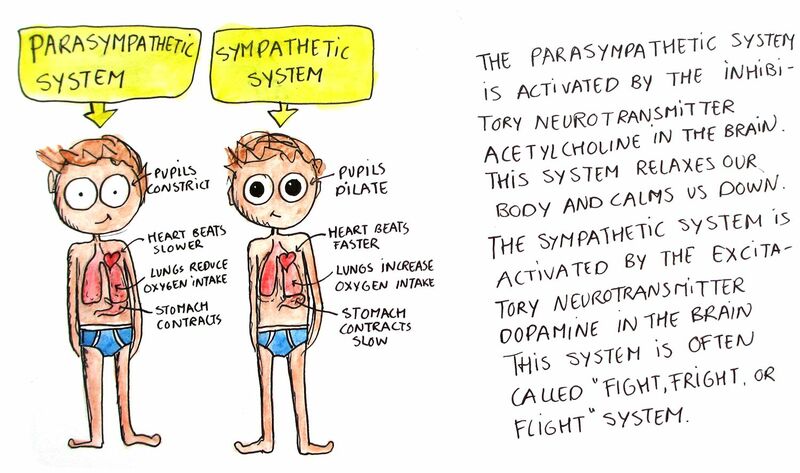 This actually helped me better understand the nervous system for my anatomy class. Thanks! Can you try and explain the person that is, roughly said, half an introvert, half an extrovert. Would that mean their level of acetylcholine and dopamine is about the same, and they use both pathways, sometimes one, sometimes the other (since they can’t really use both at the same time, I guess..lol)? Thanks so much for this! 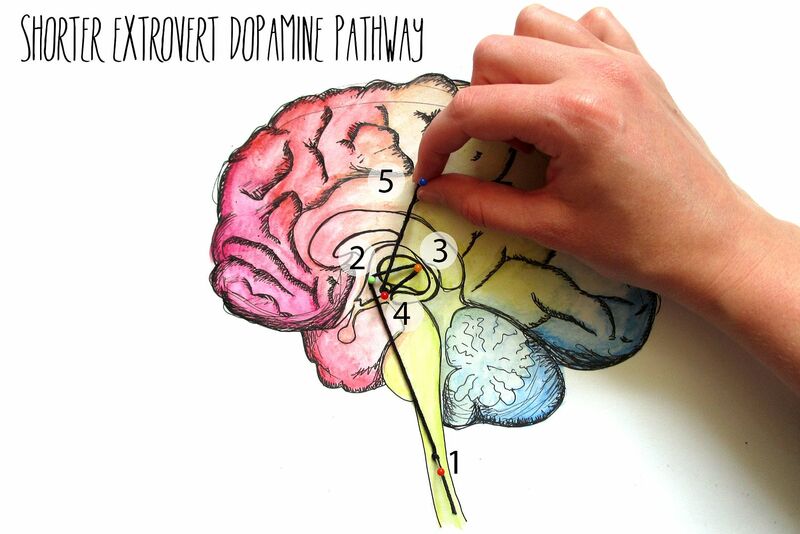 Amazing to see introverts are actually wired differently, and this can be shown by research. Thus, what we feel is not figment of our imagination, or a result of not trying hard enough.. It would be so great if there were more places to go to especially suited for introvert. In the same way that lots of places are suited for the needs of extroverts (lots of loud music, tv screens with energy demanding visuals, large gatherings of people, having lunch with the entire team, introduction weeks at school where there is hardly time to reflect or be by yourself) In serving the needs of introverts I’d loveto see E.g. quiet corners to recharge energy at work, or quiet zones at crowded places like train stations. How about turning off the ever present tv or radio in restaurants or cafes? This can go as far as being aware of how table settings are done at a meeting with friends or familiy.. A big circle (where you absorb impressions about everyone) can be really tiring for an introvert. But if there are possibilities to sit and talk one-on-one or with smaller groups, being with a ‘group’ suddenly becomes less energy consuming… Do you guys also experiecne being with a group is less tiring with a bit of alcohol? Maybe it makes us a little less sensitive to stimuli? Would love to hear your tips and tricks of dealing with your introverted side when there is no opportunity to go home and chill. How do you preserve your energy? I’ve done silly things like sometimes retreating to the toilet, and just sit there for a little while. Putting on music (and thereby locking out all other noise) helps too. It also helps to write down your thoughts when your head gets crowded with impressions, feelings and thoughts.. I can also reccomend Susan Cain’s book – Quiet. Great stuff! Hello Mariëlle! Thanks for sharing! I love it! Wonderful work! May I translate this post into Russian and publish in special issue about introverts? Thanks. It’s ok if you reference to my post in your own words, use one direct quote and one image if you link back to my post. But I rather not have you literally translate and copy the whole thing, since I spent a lot of time creating unique and valuable content. is it an introvert thing to prefer to keep projects on the low until they are completely finished?… is it an introvert thing to love surprising others but hate to be surprised??? I wish I could tell you the answer to that but I don’t know :) Does it matter if it is an introvert thing or not? if yyou knew of any discussion boards that cover the same topics discussed in this article? other knowledgeable people that sharre the same interest. If yoou have any suggestions, please let me know. Thanks! 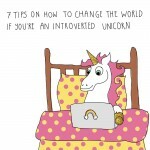 7 Special Talents Introverts Didn’t Know They Had - Czaal is a source for deep thinkers, lifelong learners and truth seekers. Posts on science, self-improvement, psychology, unexplained mysteries. I really loved this article. Is very well explained and made me understand so much about introversion and how the body is designed for it. Thanks a lot and keep up the great work! Det må være noe galt med meg. – Introvert og elsker det. Why Do Introverts Love Being Alone? Here’s The Science | Believe Fine Arts, Inc.